Transporting water just got easier with these plastic leg tanks! They can be easily mounted on pick-up trucks and flat beds with no need for saddles. Where’s the support? These tanks are designed with molded grooves for bands or hoops to anchor and support them. The polyethylene construction provides strength and durability to stand up to the rigors of daily use. 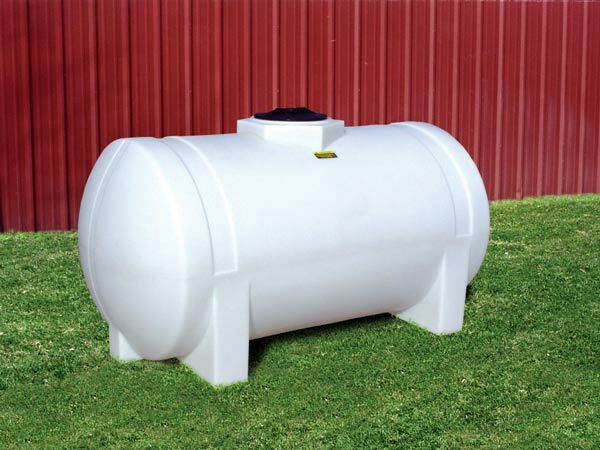 The plastic leg tank is also UV Stabilized to protect against outdoor weathering. Need to store drinking water? No worries! This unit is approved for the storage of potable water. Choose from natural white or “Algae Resistant” black for coloring. For your convenience, the bulkhead fittings can be mounted on either end of the tank. With a 5 year limited warranty, you simply can’t go wrong! Can Horizontal Leg Tanks be used to store drinking water? Do you carry 100 gallon Leg Tanks? Do you sell tanks already mounted on trailers? Need a poly tank mounted on a trailer? Check out our Water Buffalo Trailers. They're available in sizes from 500 to 1,600 gallons.